Something red, Something white and now something blue...It's the 4th of July! The other day MM came home from work with 3 boxes of blueberries. 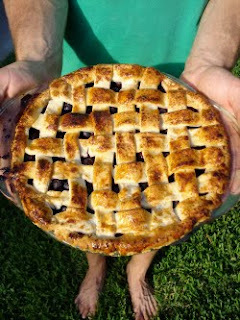 'Nah...Blueberry Pie,' he responded as he rushed to the fridge. A man who makes pies for fun? I can totally respect that. In fact, I LOVE that. 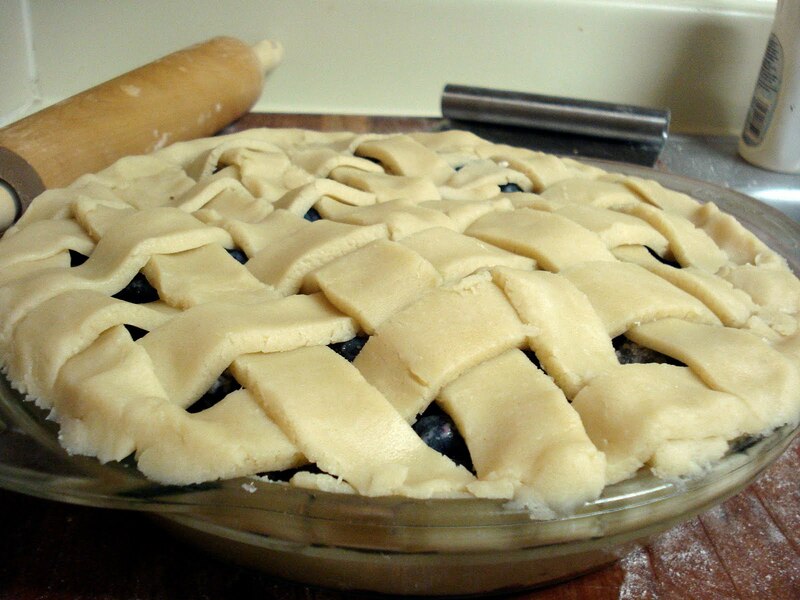 And so I give you on this wonderful fourth of July weekend...Blueberry Pie a la Mountain Man. 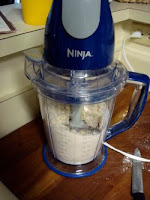 Place flour, sugar and salt in food processor and pulse a few times. 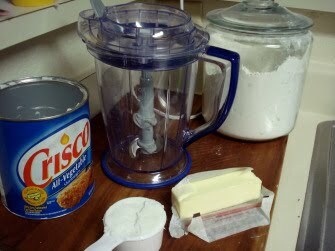 Add butter and shortening, a few chunks at a time, pulsing as you go. 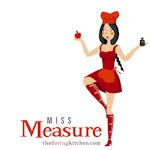 Sprinkle in lemon juice and continue to pulse, inhibiting the development of gluten. Pulse until you reach a chunky mixture- Don't over mix! Add half water and begin processing, adding in the rest as you go. Once incorporated, stop. 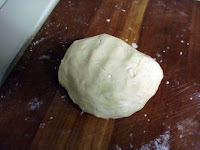 Dump dough out onto a lightly floured surface, giving the dough a quick knead forming into a solid ball. Cut the ball in half and shape each half into a disc. Wrap in plastic wrap and refrigerate for about an hour. After refrigeration, bring one of the dough discs to your lightly floured surface and roll out into a circle**. **There are many theories on rolling, but I find that rolling from the inside out and only going in a singular direction versus back and forth works best. To make the move to the pie pan easier, fold the dough in half and then again (quartered). Once transfered to the pan unfold, smooth out and cut off excess hanging over the edges. In a small bowl combine sugar and corn starch, mixing well. In a larger bowl, place rinsed blueberries and add lemon juice. Sprinkle sugar mixture, but make sure to reserve a bit for the end. Using your hands, as spoons can damage your berries, mix well and pour into pie shell. Finish off with a sprinkling of remaining sugar. Roll out remaining disc of dough just as you did the first. This is where you have options for your finishing touches: A simple solid top is very easy and can be very elegant. I have also seen shapes cut out with a cookie cutter and places in layers on top which can be very festive. 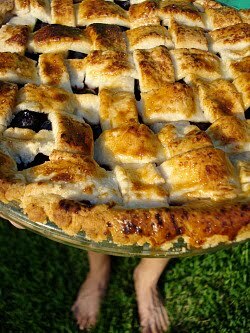 I however, love the challenge and intricacy of a lattice crust. 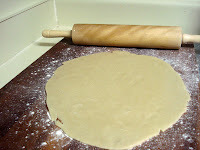 With the dough rolled out, cut 3/4 inch wide strips that are the length of your pie pan. I start from the middle and in one direction follow a simple over-under pattern by folding back one side of the dough strip when laying the next layer down. 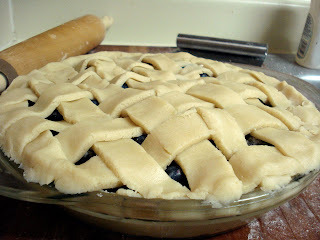 Continue until the entire top is covered and then crimp the edges. Refrigerate for another 30 minutes while the oven preheats to 425. Just before baking, brush with a wash of 1 egg yolk and 1 tsp of cream and finished off with a sprinkle of sugar. Bake at 425 for 20 minutes then tent with foil and bake at 350 for 20 minutes more. The hardest part? Letting it stand and cool for 2 hours before you can dig in! Happy Baking and Happy 4th of July! !